Beacon Academy’s robust service learning program provides students an opportunity to serve while becoming knowledgeable in an area of interest. We offer a broad range of opportunities throughout the year to serve local and global communities through our partnerships with dozens of non-profit organizations. At the beginning of each school year at our annual Service Learning Fair, students will be introduced to many of our non-profit partners. After learning about our partner organizations, students will note their areas of interest and then will be notified of upcoming events specific to their interests. 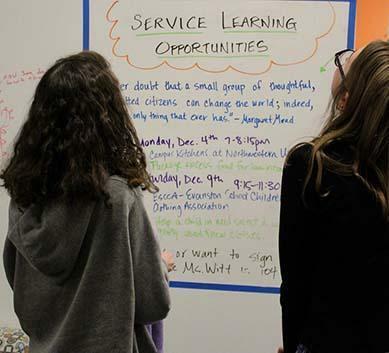 In the weeks following the fair, students are invited to meet with the Service Learning Coordinator to design an individualized plan that will evolve over their time at Beacon Academy. The plan will take into consideration student availability, transportation, interests, and service experiences. Each month students are informed of various service opportunities and are encouraged to participate to gain exposure to a broad range of service. Individualized planning is also available for students with a more specific area of interest. After a service experience, students may choose to complete reflection forms. This will allow students to consider their experience, and these forms will be compiled in each student’s service learning folder in order for the student’s comprehensive service experience to be noted. Please contact Jori Witt, Service Learning Coordinator, for more information.